When titling my posts sometimes they say funny things- until I quickly edit them silly-lolly bloopers out. This one did much better with the word “bar” added, if you know what I mean. 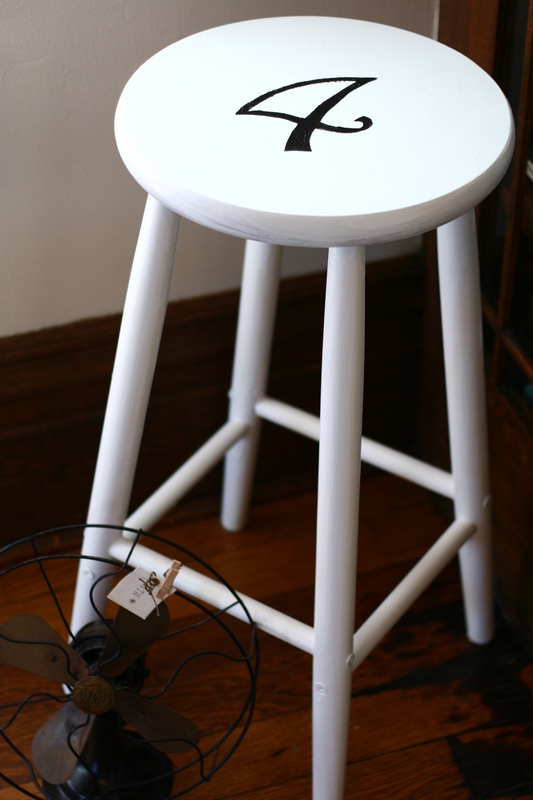 All I`m showing today is a tiny little BARstool redo. I soo wish I had a better before picture. “I was too lazy to go and get my camera, and then take it down to the basement, snap a picture of total junk, and then walk back up the steps with the camera, to hang it on the door where it belongs”. But anyways- I will describe it to you. (How the stool looked before). Splattered in paint from being the item that “held” all of my other junk, when the other junk gets spray painted. 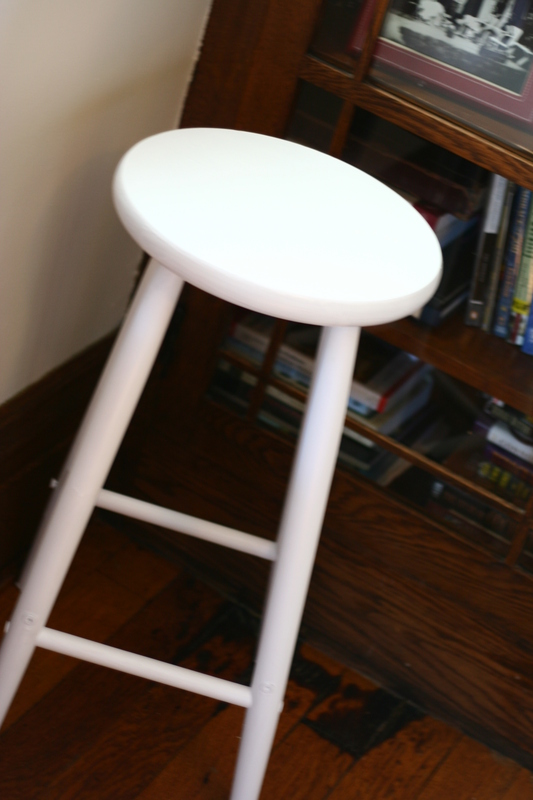 The top of the barstool being that faux natural wood look. It was originally from IKEA, although I bought it at a thrift store for $6- years ago. Before I was married. Or even had a boyfriend named G. Or even knew OF A MAN with the name G.
Yes, I have to think in a panicked way when the receptionist asks me what year my girl`s were born. But I remember the price of a barstool, bought years ago. DID NOT KNOW THIS WOULD BE SO AWKWARD. Here she is primed and looking pretty. I know it`s a “she” with those long skinny legs. Decided to try the “freezer paper method” again. 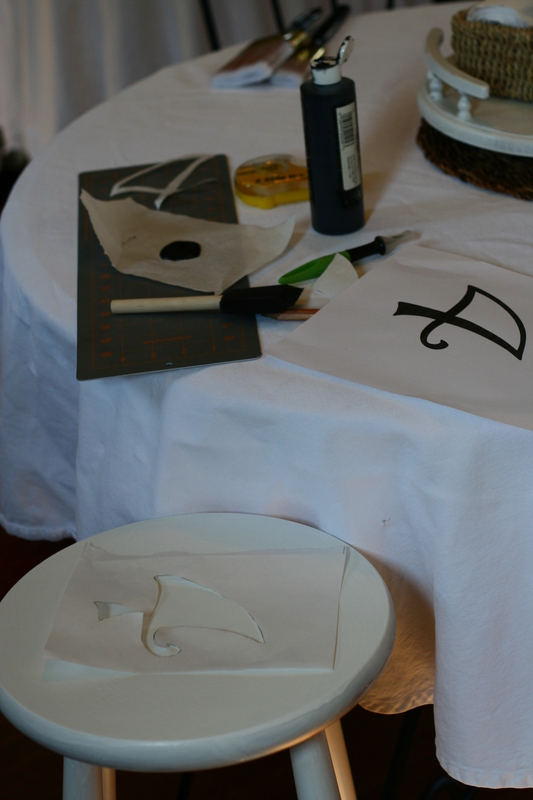 Since I obviously couldn`t iron this stencil I made on, I just used double sided tape. YES, the number 4 has meaning! There are FOUR of us in my litttle family. ..
“Well, they are very “in” right now on stuff I look at”. 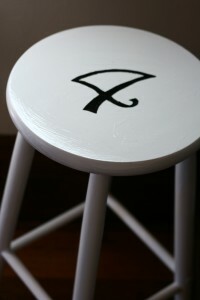 I finished the stool with a spray on gloss to keep the stencil nice. I also used a sandpaper “eraser” to sand off the edges. We wouldn`t want it to look brand new or anything. If anyone is interested, you can read more About me here. Right now I am musing on how we can incorporate worship into our homes and decorating styles. If any of you have insight on this, photos or comments- you want to have featured in this upcoming post, please EMAIL them to me at ilovegk@gmail.com. I have one lovely gal lined up that I can`t wait to feature a little. Check back later this week for more talk on that. And no, my porch isn`t done. It`s needs a good solid day of me working on it yet and I`m not sure when that will be exactly. This next week is kinda full…ish… I did get it sanded and cleaned and the chairs painted, so all in all– I am happy. OK, you were totally cracking me up over the “b.s.” and “Stool” situation you found yourself in. Glad you got it “all worked out!” Ha, ha!